Black Goqi Berry is a rare wild herb that grows in the western dry lands and basins of China. It was found in high-altitude lands between 2800 and 3000 meters with arid climate and pristine environment. Studies have shown that black Goqi berry contains 17 kinds of amino acids and 13 kinds of trace elements. It has the highest concentration of OPC (proanthocyanin and anthocyanin) among all fruits and herbs, which earned it the name king of OPC. OPC is a very strong antioxidant and consuming black Goqi berries have a variety of health benefits including anti-aging, self-cleansing and eye improvement. 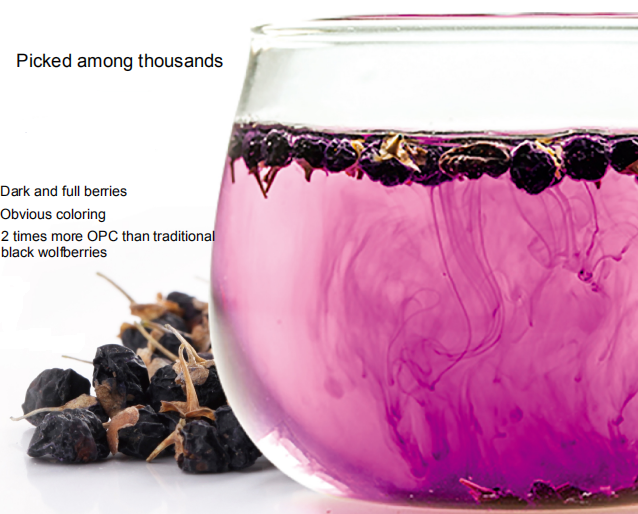 The black Goqi berry OPC can be easily absorbed by the human bodies and readily observed by eyes as it immediately dissolve in water and color the liquid purple or blue. Due to its significant health benefits, black Goqi berry is sometimes called the [black gold" in China. Looking for ideal Black Goqi Berries Manufacturer & supplier ? We have a wide selection at great prices to help you get creative. All the Anti Aging Effects are quality guaranteed. We are China Origin Factory of King of Proanthocyanin. If you have any question, please feel free to contact us.